Is Buying a Gym Membership Worthwhile? Home | Is Buying a Gym Membership Worthwhile? Inside: Find out if buying a gym membership the best option. You just did 30 burpees! That had to have burned almost 200 calories, right?! Looks at fitness tracker. *Sigh*. More like 35 calories. Getting older means that I’m becoming more aware of my health and fitness. I’ve been contemplating a gym membership again, but have been wondering if it’s a waste of money, for me at least. Maybe. After college I had a gym membership at a large chain fitness center in the hopes that having to pay meant I would make use of the gym regularly. For the most part this idea worked. I probably payed too much for the privilege of using the gym, paid for a trainer, and went at it. My strength improved and I looked better, though I was constantly sore. Is it supposed to be like that? Sore even after six months? At the time, having a trainer motivated me, ensured I was using equipment properly and form was correct. He also made sure I didn’t slack off. After several months of making good progress, I came down with a nasty flu that knocked me out for a solid three weeks. I never really got back into the workout routine after that illness. I’d start up again (no longer paying a trainer at this point), and then visits to the gym would become sporadic. Lather, rinse, repeat. Illness or vacation throws me off track. We later bought a home gym and a set of dumbbells, congratulating ourselves on time and money we would save. But as with the gym, consistency is everything. Honestly, it should be enough, but looking back, we could have made smarter purchases. When I do take the time to workout, dumbbells and various body-weight workouts via YouTube are all that has been needed. However, I want to step it up a notch. Our home gym doesn’t have a pull-up bar or a squat rack and those would be very useful for additional strength training and safety. I could go back to a fitness center again, paying $30-45+ per month and have access to all the equipment I could need. The community center has some great fitness classes and machines but is rather light on free weights. And running? Not going to happen, but plenty of people find that a quite effective and affordable option. Is a gym membership worthwhile? 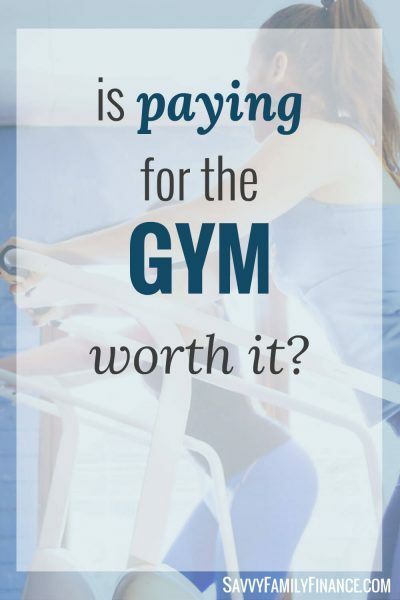 Are gym memberships worth it? Perhaps. Would you honestly go consistently, after sickness and in health? Would you be satisfied with various home workouts? Does your community center have more affordable access and options? Does your health insurance plan or employer offer membership discounts? The workout habit needs to happen, period. So once an at-home routine is established, maybe we can look at selling part of the home gym for a membership or a better power cage setup if more intense weight workouts are wanted.